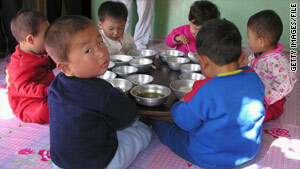 Many North Korean children, like these shown with World Food Programme provisions in 2005, battle malnutrition. (CNN) -- About 5 million North Koreans will continue to face food shortages because of a grain deficit, two United Nations agencies warned Tuesday. North Korea requires 867,000 metric tons of grain to feed its people for the next 12 months but the government plans to import only 325,000 metric tons, according to a recent study by the Food and Agriculture Organization and the World Food Programme. The agencies are urging international donors to make up for the large deficit. Their report said representatives visited warehouses in seven of 10 provinces in the isolated communist nation. The warehouses contained "no cereal stocks while low quality maize available for distribution in October came from the summer harvest and, due to inadequate drying facilities, had excessive moisture content and contaminants," they said. Millions of North Koreans have gone hungry in recent years. They have reduced their food intake, and more children are consequently malnourished.